The Lexicon PCM92 features the highly acclaimed Hall, Concert Hall and Random Hall reverb algorithms that are consistently used by live sound and recording engineers because of their exceptional ability to reproduce the musical ambience of large, wide, panoramically wonderful spaces. In fact, these classic Lexicon Hall algorithms have been used on more than 80% of all recorded music. One of the stunning advances in the Lexicon PCM92 is the ability to create incredibly realistic small spaces. For both music and film production, it is often vital to have the ambience of a phone booth or very small drum room. In the Lexicon PCM92 you can create them with a reality never heard before from any processor other than a Lexicon. In addition, the Lexicon PCM92 delivers new capabilities to traditional reverbs by adding multimode filters in the audio flow. 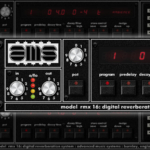 This allows more exact shaping of the reverb while still maintaining that distinctive smooth, rich “Lexicon Sound.” Also, all reverbs have an “Infinite” switch that allows the reverb to run forever, which is useful for creating unusual backgrounds and sound effects. Designed as a single rack space processor with two channels of balanced XLR or 1/4″ analog I/O and two channels of XLR AES/EBU digital I/O, along with MIDI, Word Clock, and Ethernet, the Lexicon PCM92 complements any large scale mixing console or integrates easily in your studio. Whether you require perfection on stage or the gold standard in the recording studio, the Lexicon PCM92 delivers the versatility and smooth, rich sound that is unmistakably Lexicon. The Lexicon PCM92 is as simple to operate as it is a pleasure to listen to. Just load a preset and the easy to use front panel keeps the most logical parameters within reach on the high-resolution display for adjustments and fine tuning. For in-depth sound design, you also have the capability to transition deeper into the algorithm and edit the full matrix of parameters. To supplement front panel navigation for live applications, the Lexicon PCM92 can be configured and fully controlled remotely through Harman HiQnet System Architect from any PC. System Architect uses the Harman HiQnet protocol to configure and control the Lexicon PCM92 seamlessly within a larger audio system that may consist of Harman Professional brands such as JBL, Crown, dbx and AKG. Also, foot pedal controllers make it easy to change presets and adjust parameters during live performances. The Lexicon PCM92 can be controlled by either a two button momentary foot switch or a variable position foot pedal. The Lexicon PCM 92 can be divided into four virtual machines which allow the signal from each input to be routed through a variety of algorithm combinations. With all the flexibility you would expect from a native plug-in, this powerhouse Bundle delivers 7 legendary Lexicon reverbs with hundreds of the most versatile and finely-crafted studio presets, including recognizable classics from Lexicon’s immense library of sounds.